“To Grow in God’s Word And Share God’s Love"
Whether you are an experienced quilter, or someone that would like to learn about quilting, the St. Paul Lutheran Quilters invite you to join them. 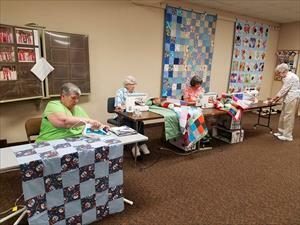 There is a wonderfully humble, dedicated group of women that faithfully meet in the church Fellowship Hall once each month to share their talent and passion for sewing and quilting. On the first Thursday of each month, starting at about 9:00 a.m. our fellowship hall comes alive with the sound of scissors snipping, sewing machines humming, and lively conversation. The tables are covered with multi-colored fabric that is being transformed into quilts of many sizes and color combinations. There are about 13 regular attendees at these monthly quilting days. Some come for the morning, some bring a lunch and stay on into the afternoon, some leave for lunch and come back for the afternoon. There are about five others that come to pick up quilts to take home to finish sewing the edges after the tying is finished. There are a few others that work on quilt tops and backs at their homes and bring them back for the quilters to tie. So, where do all these quilts go? The quilts are a labor of love for various mission project, both locally and internationally. Many of the quilts are delivered to Lutheran World Relief for distribution in needy countries. Some are donated to local shelters. Some are taken to the Union Gospel Mission. They have sent some with mission groups to Robin's Nest Children's Home in Jamaica for the children there. They also donate quilts to the Quilt Auctions of two Lutheran Bible Camps that sell them at their annual fund raisers to raise money for the camps - Lake Wapogasset Lutheran Bible Camp in Amery, Wisconsin, and Camp Onomia in Onamia, Minnesota. The past few years, they have also made and given quilts to our high school graduates on the Sunday that we honor our graduates in the spring and we give a baby quilt to each newly baptized baby. If you are interested in quilting, either as an experienced quilter or as someone that is interested in learning, these ladies would love to have you come join them. Again, they meet on the first Thursday of each month in the church fellowship hall beginning at 9:00 a.m. You can come as you are able, you don't have to commit to being here each month if that doesn't work into your schedule. If you are curious to see what they are doing, you can stop in on quilting day and say "HI" and check it out. They would love to show you what they are working on and tell you about the quilts and what they are used for. 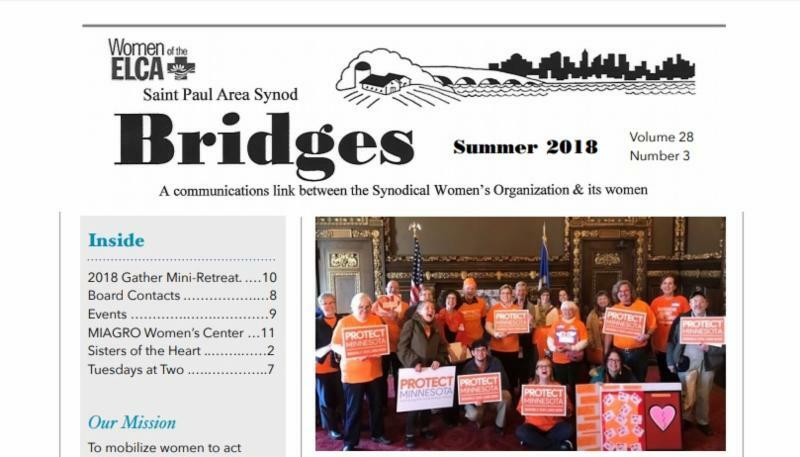 The Saint Paul Area Synod chapter of the Women of the ELCA publishes its Bridges newsletter quarterly. Download the Winter 2018-2019 issue (PDF)! The Saint Paul Area Synod chapter of the Women of the ELCA has many exciting and interesting things happening, and good information to share! Download your copy of the summer 2018 issue. To download or read a copy of the publication Cafe - a publication by and for young women who write about faith, relationships, advocy and more. The readers and writers include pastors, seminary students, and other young adult women who use Cafe as a Bible study resource individually or with a group. © Copyright , Saint Paul Lutheran Church. All rights reserved.